Excess nitrogen (N) and phosphorus (P) applied to agricultural fields may be transported to adjacent surface waters and exported to downstream systems, leading to environmental issues including algal blooms. Management practices associated with fertilizer application, including the input rate and source (e.g., inorganic vs. organic), influence N and P accumulation within agricultural fields and may ultimately determine N and P loss in surface and subsurface hydrologic pathways. 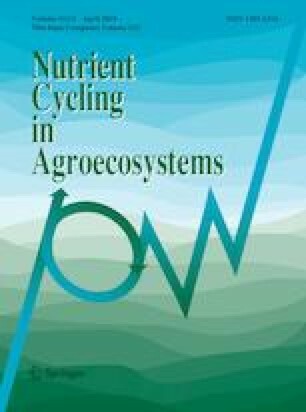 In this study, we used management data provided by individual farmers to quantify annual agronomic N and P balances across 40 monitored agricultural fields in the Western Lake Erie Basin for a total of 150 site years; positive balances indicate nutrient accumulation and negative balances indicate nutrient drawdown or reduction, after accounting for all agronomic inputs and outputs. We examined the effect of application rate and fertilizer source on in-field agronomic N and P balances, as well as determined the relationship between in-field agronomic N and P balances and hydrologic N and P losses. We found that in-field agronomic balances of N and P increased with application rate and varied among fertilizer sources; fields receiving mixed or organic fertilizers had greater N and P agronomic balances compared with inorganic fertilizers. Both hydrologic N and P loss increased with in-field agronomic N and P balances, demonstrating that nutrient accumulation within agricultural fields generally increases nutrient loss. Additional controls on hydrologic N and P losses varied, with hydrologic N loss strongly controlled by total discharge while hydrologic P loss differed among fertilizer sources and indicated legacy P in some fields. These results highlight that both nutrient and water management practices are likely necessary to achieve water quality improvements in downstream lentic and coastal ecosystems. We would like to thank the landowners of the study sites who provided access to their fields and management data. We are also grateful to Jedediah Stinner, Katie Rumora, Sara Henderson, Marie Pollock, and Phil Levison (hydrologic technicians, USDA Agricultural Research Service , Columbus, Ohio) for their help in data collection and site maintenance, as well as Eric Fischer (laboratory chemist, USDA ARS, Columbus, Ohio) for analytical expertise. We would also like to thank The Ohio State University for hosting the USDA ARS Soil Drainage Research Unit and providing academic access to faculty resources, libraries, and students. Funding for this project was provided in part by: The 4R Research Fund (IPNI-2014-USA-4RN09); US EPA (DW-12-92342501-0); Conservation Innovation Grants (The Ohio State University—69-3A75-12-231; Heidelberg University—69-3A75-13-216); Ohio Farm Bureau Federation (58-5080-7-005); Ohio Corn and Wheat Growers Association; Ohio Soybean Association; NRCS Mississippi River Basin Initiative; The Nature Conservancy; NRCS Cooperative Conservation Partnership Initiative; and USDA Conservation Effects Assessment Project (60-0202-7-001).